In a revelation the Lord said, “Blessed is my servant Hyrum Smith; for I, the Lord, love him because of the integrity of his heart, and because he loveth that which is right.” (D&C 124:15.) I personally know of no higher praise that any man could receive. I have felt impressed to speak today about the need for integrity﻿—old-fashioned, personal, practical integrity. To me, integrity means always doing what is right and good, regardless of the immediate consequences. It means being righteous from the very depth of our soul, not only in our actions but, more importantly, in our thoughts and in our hearts. Personal integrity implies such trustworthiness and incorruptibility that we are incapable of being false to a trust or covenant. “It is given unto you to judge, that ye may know good from evil; and the way to judge is as plain, that ye may know with a perfect knowledge, as the daylight is from the dark night. Like Job of old, we need to say, “Till I die I will not remove mine integrity from me.” (Job 27:5.) Though he had lost almost everything he valued﻿—his family, his friends, his health, his wealth﻿—he refused to give up his integrity. In sharp contrast, many today trade away their integrity for a very small price tag. A person who shoplifts for a candy bar, or makeup, or jewelry trades priceless integrity for a meager gain. A person who falsifies a tax return by not reporting income or claiming invalid deductions compromises valued integrity for a pittance of unpaid income tax. One who avoids paying bills promptly for goods or services received exchanges cherished integrity for a perceived temporary advantage. Husbands or wives who are unfaithful to their spouses trade their prized integrity for a fleeting moment of mirth. Integrity is so precious that it is beyond price; it is invaluable. Joseph, the son of Jacob, was a model of integrity. No doubt many of you have been reminded of him recently in a Sunday School class. Joseph’s integrity placed him among the greatest of our Heavenly Father’s sons. He did what was right and good; he was trustworthy and incorruptible, self-disciplined never to violate a trust. Because of his integrity and righteousness, Joseph was favored and blessed of the Lord in every circumstance. His life is evidence that “all things work together for good to [those who] love God.” (Rom. 8:28.) His example is especially pertinent to us because most members of the Church have descended from his loins. His father, Jacob, loved Joseph even from his youth. The Lord revealed future events to Joseph in dreams. However, his brothers hated him, plotted to take his life, and then sold him as a slave. When he was carried captive to Egypt, the Lord was with him there. Joseph became overseer of the house of Potiphar, captain of Pharaoh’s guard. When approached by Potiphar’s wife, Joseph refused and fled from her improper advances because of his personal righteousness and because he would not violate Potiphar’s trust. This refusal and the accusations it prompted caused Joseph to be imprisoned. Again the Lord was with him. Joseph became overseer of the prison. The Lord enabled him to interpret the dreams of Pharaoh’s butler and baker, and later, Pharaoh’s dreams of seven fat and lean cows and of seven full and thin ears of corn. Subsequently, Joseph became ruler over all Egypt, second in rank only to Pharaoh. He directed the storage of food during the years of plenty and the dispensing of it during the years of famine. During the famine, Joseph’s brothers, who had sold him as a slave twenty-two years earlier, came to Egypt to obtain food. Not recognizing him, they bowed down to him because of his high office. “I am Joseph your brother, whom ye sold into Egypt. “And God sent me before you to preserve you a posterity … and to save your lives by a great deliverance. Through Joseph, the Lord preserved the children of Israel and provided a place in Egypt for them to flourish and increase. This story is well known, but I urge you to read it again, focusing your attention on the integrity of Joseph and on the blessings it brought to him. He became the birthright son in the house of Israel and received an inheritance in the lands of the Americas. (See Ether 13:8.) The Lord permitted him to prophesy of Moses, who would deliver the children of Israel out of Egypt (see JST, Gen. 50:27–29), and of Joseph Smith, the prophet of the restoration of the gospel in the latter days (see JST, Gen. 50:30–33; 2 Ne. 3:6–21). A more modern life of integrity is exemplified by George Washington, first president of the United States of America. His integrity and character, more than the brilliance of his intellect, made him the choice of his countrymen as their leader. He loved the peace and tranquillity of his Mount Vernon estate but responded when duty called him into the turmoil of public life. He refused any compensation, expecting the government to pay only the expenses, of which he kept an exact account. He gave forty-five years of his life in the service of his country. (See David O. McKay, Secrets of a Happy Life, Salt Lake City: Bookcraft, 1967, pp. 142–44.) As I visited the Mount Vernon stake two weeks ago, I felt the spirit of George Washington, the father of his country. The noble deeds of this great man passed through my mind. 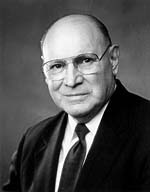 President Ezra Taft Benson, our prophet, seer, and revelator, is an example of sublime integrity. His assignment to Europe by the First Presidency to relieve the sufferings of our Saints after World War II exemplified the nobility of his character. “A man’s true greatness is not in what he says he is, nor in what people say he is; [but really] in what he really is.” (Hartshorn, p. 38.) Our integrity determines what we really are. “Ye shall do no [injustice] in judgment, … in weight, or in measure. We must be honest with the Lord as we pay our tithes. Faithful Saints have learned that he will “open … the windows of heaven, and pour … out a blessing, that there shall not be room enough to receive it.” (Mal. 3:10.) The payment of tithing has less to do with money, but more to do with faith. Let us return one-tenth of our income to the Lord (see D&C 119:4) and never be guilty of robbing him by failing to pay our tithes. Then, we also should remember those in need and contribute generous fast offerings for their assistance. We show our integrity by caring for and serving others. Let me cite an instance where family members, a Christlike bishop, home teachers, visiting teachers, and ward members so lived. A young mother of eight children was left without a husband. The oldest child was twelve, the youngest barely one, and one daughter was confined to a wheelchair. This mother moved to a ward that was close to her family and friends. Being single and divorced, she feared that she might be ignored or shunned. However, as she was moving in, ward members streamed in to welcome her, bring food, and offer assistance. She hardly had time to direct those who were unloading the moving van. After getting settled, she and her family received innumerable expressions of service and love. Her home teachers repaired her appliances and other household items. Her visiting teachers kept very close and made sure she never had to go alone to a Church activity. At Christmastime, she found money left anonymously on her porch or had it given to her in a handshake. She received hundreds of dollars toward the purchase of a wheelchair-lift for her van. After being out of town briefly, she returned home and found that ward members had renovated her kitchen. Her parents, brother, and sisters provided financial and emotional support. They helped take care of her children, accompanied her to the emergency room with a daughter who was very ill, built a ramp to the front door for the wheelchair, built shelves for food storage, and helped with yard work. All of this kindness lifted her spirits and gave her courage to meet the trials and hardships of each day. Those who looked after this young mother practiced “pure religion” (James 1:27) because of their integrity. Let us “go, and do … likewise” (Luke 10:37), as the Savior taught in the parable of the good Samaritan. The rewards of integrity are immeasurable. One is the indescribable inner peace and serenity that come from knowing we are doing what is right; another is an absence of the guilt and anxiety that accompany sin. Another reward of integrity is the confidence it can give us in approaching God. When virtue garnishes our thoughts unceasingly, our confidence is strong in the presence of God. (See D&C 121:45.) When we are doing what is right, we will not feel timid and hesitant about seeking divine direction. We will know the Lord will answer our prayers and help us in our need. The consummate reward of integrity is the constant companionship of the Holy Ghost. (See D&C 121:46.) The Holy Ghost does not attend us when we do evil. But when we do what is right, he can dwell with us and guide us in all we do. My brothers and sisters, let us live true to the trust the Lord has placed in us. Let us strive for personal, practical integrity in every endeavor, regardless of how mundane or inconsequential it may seem. The small matters accumulate to shape the direction of our lives. I bear my witness that Jesus is the Christ, the Son of God, and is our Lord and Savior. This is his church. Joseph Smith is a true prophet of God, as is President Ezra Taft Benson. I bear this testimony humbly, in the name of Jesus Christ, amen.